Total-play artificial cricket practice nets facilities provide an essential resource for cricket grounds, with solutions on offer to meet the needs and budgets of clubs at all levels. All cricket practice nets facilities are built to work with the individual characteristics of grounds and tailored to suit the client’s needs; with any number of bays and to varying lengths. By investing in a new cricket practice nets facility, clubs can help retain talent at all ages through improved coaching and practice opportunities. From initial site visit though to system design, planning permission, guidance on funding and complete installation total-play offers a ‘one stop shop’ with added peace of mind that your new cricket practice nets facility is in the hands of an ECB Non-Turf Pitch (NTP) Code of Practice installer. Over the years, total-play has drawn on its team’s unique combination of experience as both professional cricketers and first class groundsmen to develop a range of non-turf cricket pitches that are designed to perform like a good level league pitch and promote every aspect of the modern game. We now boast no less than three different non turf system designs that hold ECB accreditation; offering clients unrivalled choice when it comes to selecting a base system to meet their needs yet also meet the rigorous standard set by the sport’s governing body. 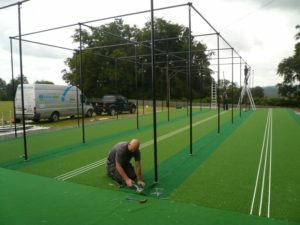 It’s not just ECB accreditation that makes total-play stand out from the crowd; by choosing total-play to construct your new artificial cricket practice nets facility, you can rest assured that things like a deeper aggregate base, thicker than usual steelwork for netting frames and full-width carpet to minimise maintenance – alongside a host of options – will set your new facility apart from the competition. This attention to detail and commitment to quality means that total-play non-turf cricket practice facilities can be found at clubs playing from grass roots to first class level, at leading schools across the country, and in high profile sporting facilities such as the Queen Elizabeth Olympic Park. Whilst the design and components of our three ECB approved non-turf pitch systems remain the standard wherever they are installed, no two total-play cricket practice nets facilities are exactly the same. We take into account an range of factors – including client budget, the geography of the site on which the facility will be built, projected usage levels and specific client requests to design a facility unique to the client. These are things that are investigated during an initial site visit during which we will also discuss, in depth, the client’s requirements and desires for the completed project. Once this has been carried out, a formal proposal including full project costs is issued to the client. 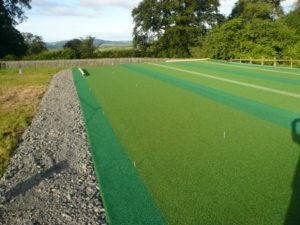 In addition to recommending which of the three total-play ECB approved non-turf pitch systems would suit the project best, bespoke elements such as white ‘coaching lines’ on carpets to aid skill development, HD Protection Tunnel ‘cocoon’ netting, the installation of lane gates / barriers to prevent unauthorised use, batting curtains & catch nets with white mesh to create sight screens and single or two-tone 3.65m wide carpet will be built into the specification. Alongside the proposal, the client will receive contact details for several nearby reference sites enabling them to visit previous total-play artificial practice nets installations and speak first hand to the host club about their experience to aid in the decision making process. Should total-play Ltd be successfully appointed, we welcome the opportunity to attend a pre-construction meeting with all key partners in the project – including the Council, the ECB and other key stakeholders. During this meeting a number of points would be discussed – including project timescales; site access; the exact location of the new facility and can include how to involve the local community in the construction phase – from school projects to community developments schemes. This meeting helps ensure that the expectations of all key stakeholders are met and that the local community, if necessary, engaged and involved in the development of the new amenity. 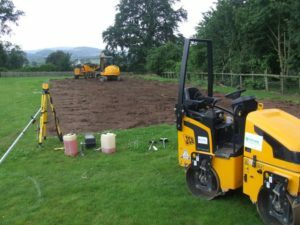 To provide the client with a high quality finish total-play only uses directly employed labour, led by an experienced and highly skilled Foreman, throughout the works. 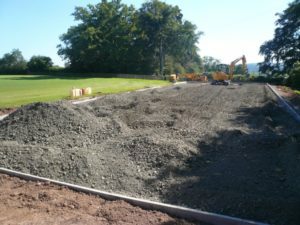 The initial groundwork phase includes turf stripping; where the area of works is marked out and the natural turf stripped back to expose native top soil. This is followed by excavation, where the team will use laser-guided equipment to result in levels that meet the facility guidelines set by the ECB and PQS. Once excavation is complete the perimeter kerb framework will be marked out before the kerbs are installed and the secondary base layer of the playing surface laid. In all total-play facilities, concrete kerbs surrounded by concrete ‘haunching’ are used to contain the aggregate layer as opposed to traditional timber edges. 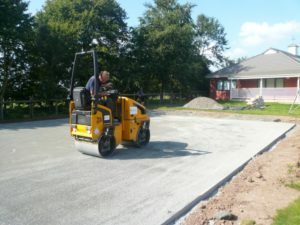 The benefits of this are numerous – concrete kerbs allow prevision installation through the use of laser guided equipment; something not possible with timber edges; they allow greater control over depths and levels of aggregate; offer long-term stability as, unlike wood, they will not decompose and mean that surface levelling is likely to be not only less frequent but a quicker and simpler job if required. 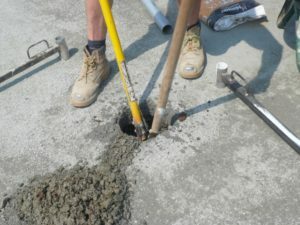 In all cases, the depth of both the excavation of site and construction of the aggregate sub-base are pre-determined by site investigation and depend on the individual site in question – non-turf cricket match pitch installations have minimum stone depth of 150mm, whereas artificial cricket practice nets may need to have up to 300mm of stone dependant on site soil type and condition (greater than the typical 100mm depth in most cases).Once the kerb framework and secondary aggregate layer is complete and laser-levelled, it’s time to lay the primary performance layer installation directly on top. The primary stone layer is laid utilising laser guided equipment and compacted to the correct levels, ready for the installation of 500mm galvanised steel sockets that will hold the steel framework. This completes phase 1 of the project. The primary stone layer is laid utilising laser guided equipment and compacted to the correct levels, ready for the installation of 500mm galvanised steel sockets that will hold the steel framework. This completes phase 1 of the project. Phase 2 of installation involves the laying of the synthetic playing surface – comprising shock pads and carpet – and the installation of any netting and bespoke elements. In total-play installations, shock pads run the full width of the system and carpets are 3.65m wide carpet to provide a fully carpeted facility; meaning there are no gaps to fill in, less nails and less joins in the surface. 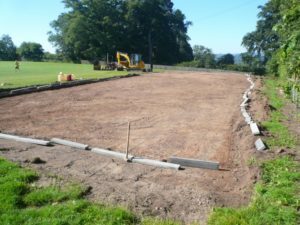 Once the carpet has been laid, the steel framework to hold the cricket netting is constructed and any joins between the lanes’ carpets are finished. The steel framework is manufactured to client’s bespoke requirements and delivered for installation on site. It is constructed from steel to be lightweight, yet incredibly strong, and is available in a range of finishes – from raw steel to powder coated in a range of colours either to match the client’s livery or in green to minimise its visual impact on the environment. With the carpets laid and the steel framework in place, the next stage involves hanging the batting net curtains on the new framework. total-play’s Protection Tunnel system, which uses a ‘tunnel’ of extra-strength netting – in each lane to form a cocoon that effectively protects players from the risk of flying balls from adjacent lanes, and offers improved tension without gaps and sagging, is a popular choice for artificial cricket practice net installations. It is attached to the framework using tension wires in each section which serve to take the strain of the netting and spread it across a broader area than the framework fixing points – especially useful in high winds and snowy conditions. The tension wire system also means that the netting is quick and easy to take down for storage or repair. The installation of netting would complete a ‘standard’ cricket practice nets facility, but there are a range of additional extras clients can invest in to tailor the system to their needs. These include batting curtains – to shield the batsman from seeing what’s happening in adjacent lanes; aiding concentration; anti-rodent nets – to prevent pests entering under the netting and damaging either the net or the playing surface; white training lines that are woven into the carpet to help bowlers and batsmen hone their skills and the use of segments of white mesh to create sight screens to help batters spot the ball on its approach. Depending on which of total-play’s three ECB accredited non-turf systems the client has chosen for its facility there may also be a choice of carpet colours – the Wilton Woven carpet used on tp365 and tpB1 is available in green or two-tone blue and green, which can be a useful visual coaching aid. There are also a host of options in terms of fencing – a number of clients opt for perimeter fencing and / or install lane gates and barriers to restrict unauthorised access to the facility – especially useful if the cricket practice nets are sited in a park or other public space. Total-play can also undertake extensive landscaping of the area surrounding the facility to ensure that it fits neatly within its surroundings. With work complete on site and snagging carried out, total-play will spend a couple of hours on site with the client to talk them through the maintenance of their new artificial cricket practice nets facility. 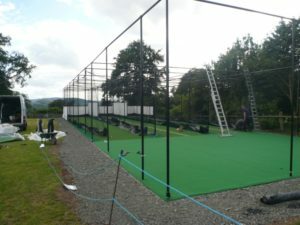 Although total-play non-turf cricket practice nets systems are low maintenance and do not require rolling or watering by the client, there are some regular maintenance tasks that need carrying out throughout the year to ensure the facility remains in top condition and that the system’s class-leading warranties remain valid. After handover, the relationship between total-play and the club doesn’t come to an end. total-play’s team of skilled operatives are available to assist clients with regular maintenance and upgrades like the 12 yearly cycles of carpet replacement in the flagship tp365 system and can also attend to assess and carry out remedial work on damage due to events like flooding or vandalism. After care packages of up to 5 years are also available; meaning that total-play will undertake any maintenance work required on the artificial cricket practice nets system on the client’s behalf. A project that illustrates the scope of the total-play artificial cricket practice nets design and installation service well is a fully carpeted 3 Lane 40m system at Durham CCC’s Riverside ground. With the playing surface built to the tp365 system design, the specification included HD Protection Tunnel Netting mounted on steel framework in a natural finish; two-tone blue and green carpeting and batting curtains on either side of the middle lane.